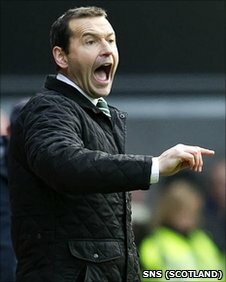 Hibernian manager Colin Calderwood was determined to take positives from his side's match with Hearts, despite the bitter disappointment of defeat. Kevin Kyle headed the only goal of the game to give Hearts a late victory. "It's a very, very unsavoury pill that we've had to swallow but we've got to take it," Calderwood told BBC Scotland. "We had a throw-in and very quickly they've gone up the other end and scored. It was a much improved display defensively, really solid, good shape." Hibs have won just twice since Calderwood took charge in October and they were second best for most of the match at Tynecastle. "We worked for one or two moments when we could show that little bit of quality," said Calderwood. "It culminated in the best chance for Colin Nish. "There might have been limited opportunities for us, we have to accept that, but the other side was a good building block. "We coped with their threats and their dangers pretty well. They're powerful and that, in the end, may have just worn us down. "We've got a couple of days off now and they deserve it because they've worked religiously hard through this period and when we come back, we've got the freshness of the Scottish Cup but we've also got a busy league programme with rearranged games so it's important that we have a good month; we've started it poorly. "We so very nearly might have taken something from it but didn't." The Easter Road side are 10th in the Scottish Premier League - 23 points behind third-place Hearts. "It's something we've obviously got to address," added Calderwood. "It was much improved on the first game against them (in November). "The fact that we're so far behind is not really the top of our list of problems, really, we've got other ones to address before that, and if we address them the gap will undoubtedly be smaller." Defender Sol Bamba is expected to leave Hibs to complete a move to Leicester and asked if he expected big changes to his squad, Calderwood replied: "No, I don't."